Stepped-up patrols in Augusta County and throughout the state will help to make it a safer New Year's Eve for many who will be out to celebrate and welcome 2009. While some will publicly party or celebrate in restaurants and bars, others will gather with friends in homes for quieter celebrations playing board games or watching movies while some will spend the evening with family, sharing dinner and watching the ball drop in Madison Square Garden. A special New Year thank you to our troops around the world and here at home, and to our homeland security defenders -- emergency personnel on duty tonight and throughout the year -- watching out for our homes, our roadways, and working in hospitals and rescue squads. Wherever you are and whatever you do ... stay warm, be safe, drive responsibly ... and a very Happy New Year 2009! The Shenandoah Valley will be cold and blustery at midnight as we welcome in the New Year. High temps for the day occurred overnight ... the thermometer will drop all day as we see snow flurries and wind gusts up to 50 mph as we remain under a high wind advisory. Overnight will be in the teens ... chill factor will make it feel like single digits. The National Weather Service has issued a Wind Advisory all of our viewing areal until 6 pm Wednesday. Wind gusts could reach 45 mph and caution should be used. A Winter Weather Advisory is also now in effect for Pendleton and Western Grant Counties in WV until 6 pm. Some of the highest peaks could pick up to 3 inches of snow. In a letter sent to shoppers today, Robert S. Ukrop, president and chief executive of the chain, wrote, "We opened the . . . store in anticipation of the significant growth expected along the [Interstate] 64 corridor." A slowdown in the housing market "suggests that development will be sluggish, at least for the foreseeable future." The other Ukrop's store in Williamsburg at 4660 Monticello Avenue in the Target Shopping Center will remain open (and appears to be doing well). Word on the street is the Roanoke Ukrop's store, after a robust start, has lower-than-expected sales. It is a beautiful store and is the western-most supermarket in their chain so it would be good to see it remain open. Thanks, Erick Erickson at Red State, for this bit of humor/ tongue-in-cheek/ truthfulness. If official records show the earth is cooling, how can libs claim we have "global warming"? Letter writer Dennis Avery from Augusta County asks that very question in the Staunton News Leader. For more about the myth of global warming, check out Icecap. Del. Chris Saxman said Monday he will introduce a constitutional amendment in next month’s General Assembly to protect the state’s right-to-work law. The Staunton delegate’s anxiety about Virginia’s right-to-work status is in part motivated by pending federal card check legislation. The 2009 General Assembly begins January 14, 2009. "Obama's Duty To Prosecute Bush For War Crimes." ... do these people not understand? We have been safe since 9/11. Known and unknown plots against this nation have been foiled since 9/11. War has been kept on foreign shores and not on our own since 9/11. The Bush Record ... did you know? * 9/11 mastermind Khalid Sheikh Mohammed was captured and is in custody. * Iraqi forces have taken over security responsibilities from U.S. forces in more than two thirds of Iraqi provinces and helped reduce attacks to the lowest level in more than four years. * More than six million children now attend Afghan schools, compared to fewer than one million in 2001; a third of these are girls who were previously barred from attending school. * The Afghan economy has doubled since 2001. * President Bush implemented the largest reorganization of the Federal national security apparatus since 1947. * More than 400 individuals and entities that posed a threat to America had assets frozen, transactions blocked, or were isolated from the U.S. financial system. * The increase in defense funding is the largest increase since the Truman Administration. * Intelligence experts believe the 2006 plot to blow up multiple passenger jets traveling from London was only weeks from being carried out. In Iraq, the United States led a coalition to remove a dictator who murdered his own people, invaded his neighbors, and threatened the United States. Because our coalition acted to remove Saddam Hussein, 25 million Iraqis are free; the Iraqi people have the most progressive constitution in the Arab world; and Iraq has become an ally in the war on terror. With Saddam Hussein gone from power, the coalition’s mission turned to helping the Iraqi people defend their freedom against violent extremists. When the battle in Iraq reached a pivotal point, the President rejected calls for retreat. Instead, in January 2007, he ordered a new strategy supported by a surge in forces. This historic decision dramatically reduced violence and created the conditions for political and economic progress to take place. 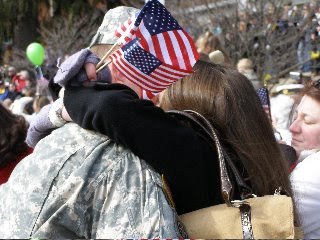 Jerry over at From On High reminds us of the great job our Citizen Soldiers do everyday of our lives. In the Augusta County-Staunton-Waynesboro area, we have many National Guardsmen living in our community. Our hats are off to them in gratitude. Is Caroline Kennedy not quite ready for prime time? Politico writes about her interview with the New York Times. The news outlets and blogs are talking about her overuse of the phrase, "you know." I am curious as to what the 51-year-old did with her husband's last name. The NYT interview is somewhat vague. The reporter seems to have had difficulty pinning Ms. Kennedy down on facts, issues, and her reasons for entering the race. I have watched Caroline Kennedy since she was a little girl riding her pony on the White House lawn, a part of Camelot. As an elementary school student, I watched as the Kennedy family went through a very public funeral after her father was assassinated ... the Onassis years when her widowed mother married the Greek tycoon and the rumored rocky relationship that followed ... Caroline's law school education, her marriage and subsequent motherhood raising three children ... the illness and eventual death of her mother ... her friendship with her brother and his untimely death, along with his wife, in a plane crash almost 10 years ago. Ironically, he was the one expected to go into politics. Through it all Caroline was in the background, a picture of grace seeking her privacy. After John Jr.'s death, only she was left of the original Camelot. It is a little painful watching what is occurring now. The gauzy view of the lady of grace is slowly eroding. I suppose my question is ... why? Why would she want to subject herself to the public scrutiny, the press interviews, the chipping away at her privacy? Nothing she has said in news interviews has answered that question, in my opinion. She has all the money in the world to live a comfortable lifestyle. She has a husband, a family, a nice home, and a law degree. She has never been that involved in politics. So I am left to wonder if she is being pushed into this ... but who would have enough influence to make her do something she may not be quite willing to do? She seems to be a reluctant participant, at best, and with her voting record (now exposed that she did not vote in every election) and her reluctance to release financial records (who wants the world to know you are worth $100 million or more? ), it raises more questions. Politics is a nasty game. Caroline has spent years avoiding the limelight. Why would she now wade into a venue where she could be chewed up and spat out? What is preventing her from answering all those questions now? That is what people want to know ... that is what news interviewers are asking ... and she remains, for the most part, vague about her reasons for running and her issues. Why not act as if this were the general election and answer the questions? Again I will say it is almost as if she has been talked into running for the position by someone. Uncle Ted, perhaps, to carry on the family legacy? I don't know the answer but I do know this: Caroline Kennedy appears to be not quite comfortable with the publicity while pursuing a powerful elected position. But could she do the job? Transcript of New York Times interview with Carolina Kennedy, December 28, 2008. A hunter in Botetourt County, Virginia, became the victim Saturday when a black bear turned on him in the Jefferson National Forest. The bear was chased up into a tree and shot by the hunters before leaving the tree and attacking the hunter. The man suffered a severe laceration to his leg and was taken to Roanoke Memorial Hospital for treatment. The bear was fatally shot by one of the other hunters in the party. First lady Laura Bush said she was offended by the recent "assault" on her husband, who had two shoes thrown at him during a recent visit to Iraq. At the same time, however, she said the assault shows that Iraqis feel a lot freer than they did before. "I know that if Saddam Hussein had been there the man wouldn't have been released, and he probably would've been executed," she said of the Iraqi journalist, who was arrested following the Dec. 14 incident and has been in custody since. Laura Bush noted that President Bush is a "natural athlete" as demonstrated by his ability to dodge the shoes. That was the headline in Investor's Business Daily last week when snow fell on Las Vegas, an event that had not occurred in some areas of Nevada since they began keeping weather records 70 years ago. The Associated Press claims that the 10 warmest years on record have occurred since Bill Clinton's second inaugural. But after it was discovered that NASA's James Hansen, Gore's chief scientific ally, had been fudging the numbers, the agency was forced to correct its data. The 10 warmest years turn out to be, in descending order: 1934, 1998, 1921, 2006, 1931, 1999, 1953, 1990, 1938 and 1939. If there's a trend there, we don't see it. So is global warming man-made and an imminent danger? As the snow falls in Vegas, don't bet on it. Fox News Channel's Neil Cavuto weighed in on the climate controversy with his Common Sense corner titled The Cause of Cold Weather Is Global Warming? The first snow Vegas has seen in 30 years. Temperatures below zero in at least 12 states in the Midwest and west, the most so early in any year. And all coming after a hurricane season that brought largely bupkis this year. “It’s all part of warming,” my friend reminded me. You see, his is not a new forecast, just a revised one. Where you can kind of have your environmental cake and eat it too. Where the earth getting warmer is warming, and the earth getting cooler is warming. Global warming continues to be disputed by scientists worldwide. Winter 2008-09 has just begun. Tell that to folks in Houston, New Orleans, Las Vegas, and southwestern Arizona's desert where snow has fallen for the first time in years ... and tell that to southwestern Colorado where four feet of snow fell this past week, and to all the other places that are experiencing snow, sleet, ice, and cold weather earlier than normal for the winter season. Ice has formed on Lake Superior off the Twin Ports and near Bayfield, among other places. It is the first time in years that ice has formed on the lake this early in the winter season. The western tip of Lake Superior has frozen over in December for the first time in recent memory, and that could mean a long season of ice angling that hasn’t been seen in years. While ice remains unsafe — with an emphasis on unsafe — as it continues to move around off Duluth, seeing any ice this early has been rare in recent years. Francisco said the earliest safe ice will come in the small bays near the mouths of local rivers like the Lester and the French. Francisco said in the rare years recently when Lake Superior has partially frozen, it’s usually in February or early March, after months of cold weather. Anglers and ice skaters had a few weeks of good ice in February 2007, for example, before temperatures rose and the ice blew out. Check out these photos of the Alps where record snowfall of over six feet has been recorded for the first time this early in the season since 1960 (h/t Icecap). January 20, 2005 ... inauguration of President George W. Bush to second term as President of the United States. In Afghanistan, the United States and our allies removed the regime that harbored the terrorists who plotted the 9/11 attacks. As a result, more than 25 million Afghans are free; the terrorist training camps have been shut down; and Afghanistan has become an ally in the war on terror. Today Afghanistan has a democratically elected President, a national assembly, and a market economy. Women are voting and starting their own businesses. Millions more children are in school, including girls who were once banned from the classroom. President Bush and President Karzai established the U.S.-Afghan Women’s Council in 2002 to help give Afghan women the opportunity to improve their lives and rebuild their country. First Lady Laura Bush made three trips to Afghanistan to underscore America’s commitment to this work. Although Afghanistan still faces serious challenges, the international community is working together to help this emerging democracy succeed. 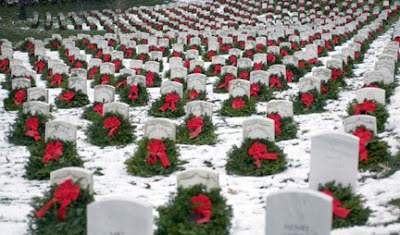 Volunteers across America helped place wreaths in national cemeteries. Here is the post of the New York Gathering of Eagles chapter from earlier this month. Thank you. "War came to our shores on September the 11th, 2001. It was a war we did not ask for, it’s a war we did not want, but it is a war that I intend to deal with so long as I’m your President." "I've been witness to the character of the people of America, who have shown calm in times of danger, compassion for one another, and toughness for the long haul. All of us have been partners in a great enterprise." The liberals at MoveOn.org have decided to narrow their "wish list" down to five of the most important issues, in their opinions, to go after now that they have a Democrat in office, according to Politico. 5) End the war in Iraq. Your wallet and freedoms are going to be threatened. In February all televisions in the United States will convert from analog to digital. Are you ready? Do you have your converter box? For more information check out Congressman Bob Goodlatte's column at SixtyFour81.com. American Power blog: "George W. Bush ... moral clarity against evil"
I liked American Power blog's post by Donald Douglas about President Bush and his leadership against the evil enemy of terrorism. Of interest is the quote from former White House press secretary Ari Flescher who, like most who worked intimately with George W. Bush over the years, knew his boss and respected his direct talk. When it came to evil, there was no gray area as far as the President was concerned ... his job was to proect the American people. I'll be the first to admit I don't understand all the controversy surrounding Ignacio Ramos and Jose Compean, the U.S. Border Patrol agents who are in prison for apprehending a drug smuggler. Am I missing something? The details I have read have me scratching my head and wondering how such an injustice could happen toward two men who were doing their jobs. And, therefore, is my confusion. Surely there must be something else to this? The facts I have read are straight forward: Ramos and Compean put their lives on the line while apprehending and capturing an illegal alien smuggling drugs into this country and were arrested by the U.S. Government and sent to prison. They were doing their jobs. What am I missing? President Bush this week added a convicted methamphetamine dealer, a cocaine distributor and two marijuana suppliers to the list of drug operators he's pardoned while in office, bringing his total of drug suppliers who have been pardoned or had their sentences commuted to 36. U.S. Border Patrol agents Ignacio Ramos and Jose Compean, meanwhile, are serving 11- and 12-year prison sentences, respectively, for shooting and wounding—in the line of duty—an illegal alien drug smuggler trying to bring over 720 pounds of marijuana across the border. The drug smuggler received only minor injuries and was given full immunity from prosecution by the federal prosecutor in return for his testimony against the agents. If you agree Ramos and Compean should be pardoned, please contact President Bush. Fox News viewers being recruited by CNN? Today during the Fox News morning show, a commercial advertising CNN's Anderson Cooper show was shown which begs the question: "Is CNN trying to recruit viewers from Fox News?" Has CNN, once that giant of the cable news industry, realized the importance of Fox News and its viewers? For the year in primetime, Fox News was the No. 6-ranked cable channel behind USA Network, TNT, ESPN, TBS and Lifetime Television. That’s two notches higher than its ranking last year. CNN, its closest news competitor, was No. 26, down one. Fox News Channel celebrated its 12th anniversary with a big ratings win that made it the second most-watched basic cable network in prime-time for the month. Interest in the presidential election and the economic drama were the chief factors driving viewership. October also has been a big month for MSNBC, whose prime-time lineup, for the first time in its 12-year history, beat CNN in the 25- to 54-year-old demo most sought by advertisers buying time in news programming. Fox averaged 3.36 million total viewers in prime time for the month, second only to TBS (3.63 million total viewers), and claimed four of the top five cable news programs for the month, which ended Sunday, Oct. 26, according to Nielsen Media Research rules. No. 1 on that list of programs for the 95th consecutive month was “The O’Reilly Factor,” which averaged 4 million total viewers. CNN averaged 2.14 million viewers in prime time. Fox News leading the pack ... not bad for a network that has been around for only 12 years. Caroline qualified but Sarah wasn't? Good read from Mary Grabar who contributes at Pajamas Media: Kennedy Qualified and Palin Unqualified? That’s Just Plain Snobbery. An Augusta County family's journey to Afton's "Bethlehem"
Last Friday night, three not-so-wise people set out on a journey to find Bethlehem. The night seemed to be darker than normal, particularly when they could not locate what they came for. While traveling further down the mountain and questioning the driver’s lack of direction, there suddenly appeared in the East a beam of light which led us not only to Bethlehem but right to the manger! In today’s world with shrinking economies and increasing trials and turmoil, the story of the birth of Jesus is as meaningful as ever. The light never left this world –- some people are now more receptive. I “gave up” my Friday night with my usual cast of characters and asked my mother-in-law and [wife] Peggy to come with me. We all were moved by the light symbolism and the atmosphere of Bethlehem -– of course we know the story -– but this year it was good to refresh our faith. I was not aware of this display until your email -– thank you! We have shared this story with our church and several have taken their own “personal” journey. Thank you again and God Bless you and your family. My thanks for allowing the story to be shared. 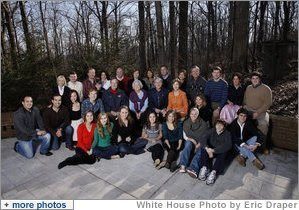 President George W. Bush and family gather at Camp David on Christmas, Thursday, Dec. 25, 2008. Seated front row, Lauren Bush, Ashley Bush, Ellie LeBlond, Gigi Koch, Elizabeth Andrews, Marshall Bush, Pace Andrews, Walker Bush. Second row, John E. Bush, George P. Bush, Barbara Bush, Pierce Bush, former President George H.W. Bush, former First Lady Barbara Bush, President George W. Bush, First Lady Laura Bush, Jenna Hager, Top row, Mandi Bush, Sam LeBlond, Neil Bush, Ally Bush, Maria Bush, Bobby Koch, Doro Koch, Margaret Bush, Marvin Bush, Columba Bush, former Gov. Jeb Bush, Henry Hager, Noelle Bush, and Robert Koch. The Smoky Mountains of eastern Tennessee are not where I have found political correctness ... Christmas is celebrated by most in the mountains around Newport, TN. Check out this story by a woman who said her, "It's CHRISTmas for Christ's sake" pin, given to her by a customer when she admired it, got her fired by Lowe's Home Improvement management. Sutton says she didn't remove it immediately. Instead, she pleaded her case to the human resources manager. "I asked him why they could sell Christmas products, sell nativity scenes," she said, "but I couldn't wear a Christian pin?" Sutton says she was told because of store policy, no one would be allowed to wear a pin supporting a religion. Video of the interview as well as the transcript are on the WATE site. One of my all-time favorite Christmas movies would have to be "White Christmas," the 1954 musical. The movie opens with a scene in December 1944 during World War II, and continues the story line with two of the Army buddies after the war, now in the entertainment business, who meet sisters and become romantically involved with them. I love this movie ... and Christmas is not complete until I have seen it each year. So far I have seen it three times this year while wrapping gifts in front of the TV. Bing Crosby and Danny Kaye absolutely made this movie work along with Rosemary Clooney and Vera Ellen. It is a light-hearted romance comedy that weaves a Christmas/winter theme into it and is set mostly at the fictional Columbia Inn Ski Lodge in Pine Tree, Vermont, during the holidays. For this snow/Christmas/winter lover, it does not get much better! Many songs are unforgettable ... "White Christmas," of course ... but also the "Sisters" tune sung by Clooney and Ellen is something my sisters and I have jokingly done for years ... not to mention the spoof of that number by Crosby and Kaye. "Snow" is the tune sung in four-part harmony on the train as the four travel from Florida to Vermont. Crosby's character, looking at the General across the room, observed, "We ate ... and then he ate. We slept ... and then he slept." To which Kaye's character quipped, "And then he woke up and no one slept for 48 hours!" The movie is about friendship, gratitude, and love ... and it is one of my "must sees" every year. My dad, who passed away in 1975, was a Navy veteran from World War II. He was 19 years old when he joined the Navy and went to war. When I was growing up he was a Sunday School teacher for 12-year-olds in our Baptist church. Dad's favorite Christmas hymn was "I Heard the Bells On Christmas Day" ... the words had touched him because of his service during war. I've missed him the past 32 years and think of him every Christmas when I hear this song. Our military men and women are working this Christmas, many far from home and away from their families. Let us remember those currently deployed or who have served to protect our freedoms and to keep us safe. This is for Dad ... it's for Nate who is with his Marine brothers ... and for all our military members, past and present. In 1897, eight-year-old Virginia O'Hanlon asked her father, Dr. Philip O'Hanlon, whether Santa Claus really existed because her young friends had told her he was a myth. Dr. O'Hanlon suggested that his daughter write a letter asking her question about Santa to the New York Sun, a prominent New York City newspaper, with the famous words, "If you see it in The Sun, it's so." "While he may have been passing the buck, he unwittingly gave one of the paper's editors, Francis Pharcellus Church, an opportunity to rise above the simple question, and address the philosophical issues behind it. Church was a war correspondent during the American Civil War, a time which saw great suffering and a corresponding lack of hope and faith in much of society. Although the paper ran the editorial in the seventh place on the editorial page, below even an editorial on the newly invented "chainless bicycle," its message was very moving to many people who read it. More than a century later it remains the most reprinted editorial ever to run in any newspaper in the English language. Virginia, your little friends are wrong. They have been affected by the skepticism of a sceptical age. They do not believe except what they see. They think that nothing can be which is not comprehensible by their little minds. All minds, Virginia, whether they be men's or children's, are little. In this great universe of ours, man is a mere insect, an ant, in his intellect as compared with the boundless world about him, as measured by the intelligence capable of grasping the whole of truth and knowledge. Carnival of Christmas is up over at Cathouse Chat for some holiday reading from bloggers around the blogosphere. Thanks, Kat ... and Merry Christmas! "For unto you is born this day ..."
And she brought forth her firstborn son, and wrapped him in swaddling clothes, and laid him in a manger; because there was no room for them in the inn. And there were in the same country shepherds abiding in the field, keeping watch over their flock by night. For unto you is born this day in the city of David a Saviour, which is Christ the Lord. And this shall be a sign unto you; Ye shall find the babe wrapped in swaddling clothes, lying in a manger. The peacefulness of Christmas Eve is settling across the land as dark moves in ... tiny twinkly lights illuminate the darkness and our Christmas tree is lighted and glowing. Christmas carols are playing ... Christmas sheet music is at the piano ready for a singalong after evening church services ... presents are wrapped and waiting ... food and goodies are ready for family and guests. 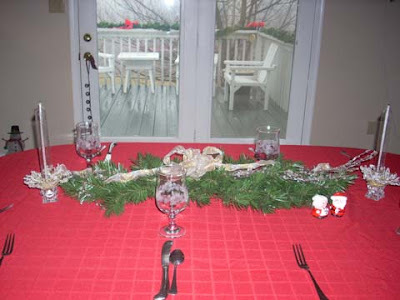 It is Christmas Eve 2008. On an extremely blustery evening that finds Augusta County under high wind warnings, there is a quiet as the world pauses on the eve of Christ's birth. Christmas Eve service will be special with music from the little ones as well as adult members of the congregation ... Alex will sing a solo ... the pastor will read the Christmas passage. 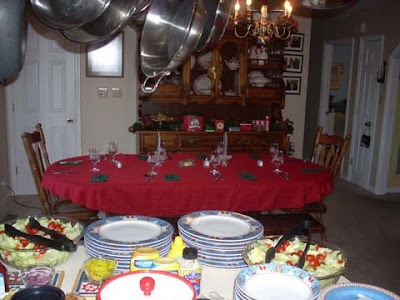 Afterwards there will be food and singing at the Mitchell household as we come back to spend time together as a family ... play board games ... sing Christmas carols ... dig into the ham biscuits and fudge ... pray for our military, for Nate, for those less fortunate who are ill or going through trials. 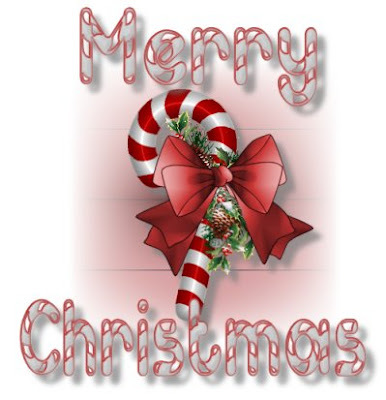 If you get a chance check out the Carnival of Christmas 2008 posted by Kat over at Cathouse Chat for some heartwarming stories of the season from bloggers throughout the blogosphere. Thanks and Merry Christmas, Kat! Thanks to all for participating in wishing our troops a Merry Christmas. We have posted the entire show under our Patriot Radio link at our site: www.theleebrothers.com or click here. We couldn’t get to all the emails so we have posted them here. Godspeed to the greatest fighting force in the world! Thanks, Lee Brothers ... and have a blessed and joyful Christmas and New Year. Worcester Wreath’s involvement with the Arlington National Cemetery project was inspired at the early age of 12 years old when, as a Bangor Daily News paper boy, Morrill won a trip to the Nation’s Capital. It was a trip he would never forget, and Arlington made an indelible impression. In later life, he recognized that his success as businessman was in large part, due to the values of this Nation and the Veterans who made the ultimate sacrifice for their country. Never a veteran himself, for fifteen years now Morrill has committed himself to remembering and honoring those who keep this country safe, with a simple wreath laid down for the holidays. Born in Jonesport, Maine, in 1949, the fifth child of Wilbur and Florence Worcester, Morrill was raised as an early entrepreneur on the farms of his youth, and graduated from Narraguagus High School (Harrington, ME) in 1968. Morrill and his wife Karen, reside in Columbia Falls, and are the parents of six children. He is a 1973 graduate of the University of Maine, with a Bachelor’s of Science in Animal and Pre-Veterinary Science. With over 35 years of business experience, the diverse ventures of Morrill Worcester make up one of the great entrepreneurial stories in the economy of Eastern Maine. From agriculture, manufacturing, construction and power generation to professional basketball and industrial baking, his collective enterprises past and present make up the second largest employer in Washington County. Current operations include Worcester Wreath Company, the World’s largest producer of holiday balsam products and a top vendor/supplier to LL Bean for 25 years; County Concrete & Asphalt Co.; Worcester Peat Co. (860 acre peat bog and harvesting operation that supplies horticultural products up and down the east coast); and since 1993, Worcester Energy Co. including its 25.85 MW biomass power plant in Deblois, Maine. 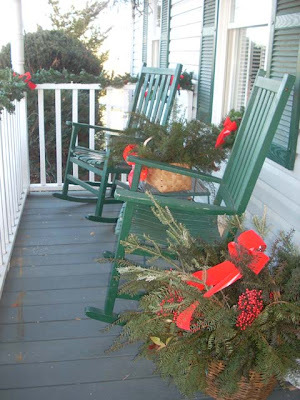 To learn more about the Worcester wreaths, check out L.L. Bean Holiday Gift Shop. Judah Maccabee: " ... It's the strength of our faith"
Two thousand years ago, one family led by one man stood between the mighty Greek army and the conquest of the Jewish people. The family was the Hasmoneans, and the man was Judah Maccabee. The Greeks were different from other empires. They didn't just want your land, your resources and your riches -- they wanted your national essence, your culture. They wanted you to think like them, live like them and even be entertained like them. The problem was most Jews weren't buying, and the Greeks didn't appreciate that. So the Greeks brought pressure to bear on the Jews. Women who insisted that their sons be circumcised were killed along with their babies. Brides were forced to sleep with Greek officers before they could be with their husbands. Jews were required to eat pork and sacrifice pigs to the Greek gods. The teaching of Torah became a capital crime. The sages and their students went into hiding in order to study and preserve the Torah. Secret weddings were held. Most Jews did anything and everything to remain Jewish. Many were tortured and murdered for their defiance. A period of darkness and suffering descended upon the Jews of Israel. And then came the Hasmoneans. Judah Maccabee was a fearless leader, a brilliant battlefield tactician and a man capable of inspiring thousands to take up arms in the battle for the preservation of Judaism. It was Judah Maccabee who conceived of ways for the Jewish forces to out-maneuver the larger, better equipped and seasoned Greek army. When at last the Jews captured Jerusalem, rededicated the Temple and witnessed the miracle of the oil, it was with Judah Maccabee as the leader of the Hasmonean family and at the head of the Jewish army of liberation. In many ways the story of Chanukah is the story of how one man and one family can make all the difference in the world for an entire people. It was the inspiration of Mattisyahu, the leadership of Judah Maccabee and the stubborn tenacity of the dedicated Jews that literally saved the Jewish people and the Jewish way of life. The pond was froze over and so was the branch. The snow was piled up belly-deep to a mule. The kids were all home on vacation from school. Just all sprawled around a-watchin' TV. There came a surprise that gave them a shock! The power went off, the TV went dead! With an armload of wood, the house was all dark. "Just what I expected," they heard him remark. "Them power line wires must be down from the snow. Seems sorter like times on the ranch long ago." And the fireplace, I reckon we'll make out all right." The teenagers all seemed enveloped in gloom. That old Christmas song about bells on a sleigh. Both Pop and the kids were all singing it, too. 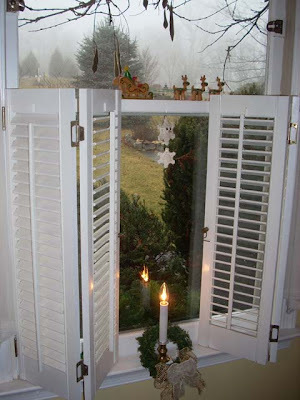 They sang Christmas carols, they sang "Holy Night,"
Their eyes all a-shine in the ruddy firelight. And Pop read a passage from God's Book of Truth. The youngsters agreed 'twas a fine Christmas Eve. And when the kids wakened, the power was on. "The power company sure got the line repaired quick,"
Said Grandpa -- and no one suspected his trick. He had pulled the main switch - the old Son-of-a-Gun! "There seems a magic ..."
"There seems a magic in the very name of Christmas." The Associated Press is reporting that Hillary Clinton has absorbed $13.1 million in campaign debt. Charlottesville, Virginia - December 22, 2008 -- If you're getting ready to tune into The Schilling Show in a few minutes on WINA AM 1070, you won't hear Rob Schilling and his program. Rob was informed after last Friday's show his program is cancelled effective immediately. The cancellation of Rob's program is a huge loss to ATTA and the entire Albemarle / Charlottesville community. Rob was a consistent voice of fiscal conservatism and a champion of the rights of the average taxpayer and common citizen. Rob provided a forum to ATTA for our message: that local government should make every attempt to spend our tax money effectively and efficiently. Indeed, Peter Wurzer and I were his final guests last Friday. We understand the cancellation was entirely a business decision in response to the tough economic times we're all facing, and that Rob's outspoken conservative message was not a factor. Also, the decision was made at the corporate level by Saga Communications (owner of WINA); and that local WINA management supported keeping The Schilling Show on the air. This cancellation means WINA no longer broadcasts any local programming with a mainstream conservative theme. "Big government" programs such as The Coy Barefoot Show, The Rick and Jane Morning Show, and Saga Communications' separate Lib-Talk AM radio station remain in place. Keith C. Drake, Ph. D.
The Albemarle Truth in Taxation Alliance is a Political Action Committee (PAC) registered with the Virginia State Board of Elections. Its non-partisan mission is to promote more effective and efficient Albemarle County government, focusing on the budgeting process and taxation issues. In 2007, ATTA educated citizens about a state law requiring a proportional drop in the tax rate when assessments rise more than 1%, and also the Albemarle Supervisors' proposed 30% tax increase. ATTA's efforts resulted in a public outcry against the tax increase and a nearly $10 million savings to taxpayers. The recipe for Forgotten Cookies was passed along by a nurse at Children's Hospital many years ago when we both worked there. At Christmas we all brought goodies to share and she brought these yummie meringue cookies that had an almond flavor with pecans and chocolate chips inside. When I asked what they were, she said they were called Forgotten Cookies because you put them in the oven at night to cook ... and forget about them until the next morning. They are one of the favorites of my family and friends. 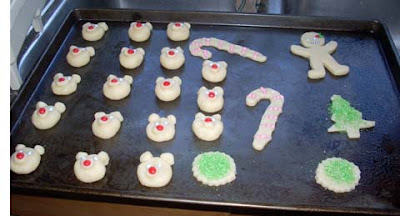 Drop by heaping teaspoonsful onto aluminum foil-lined cookie sheets coated with non-stick spray. Place in a 350-degree oven; immediately turn oven off. Let stand 8-10 hours or overnight. (Do not open oven.) Store in airtight container. They are also mentioned in the 2008 Carnival of Christmas. Enjoy! Every Christmas I display my grandmother's Christmas quilt on the hall tree that was in her house and now is in the entryway of my home. 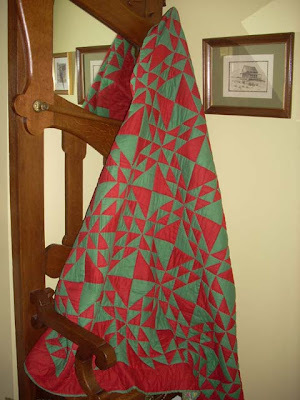 The quilt is red and green on one side ... and a flowery floral print on the other ... typical of the practical necessity of not have holiday-only items in the house. Practical was a way of life in the hard-scrabble mountains of southwest Virginia and, later, in Chesterfield County where they moved to better their lives. My grandmother was named Mollie and was born in 1885 in Alleghany County, NC, which is located in the Blue Ridge Mountains just over the state line from Virginia. She married my grandfather who was from Grayson County, VA, just over the state line from NC, and together they raised 10 children. My mother is their youngest and only surviving child. I have several quilts that Grandma made with her own hands or with neighbor women. As a child I can remember the quilting frame set up in a spare bedroom where they worked when time allowed. I'm sure the quilts would be very valuable in the market place ... but they are far more valuable to me. When I was young we actually used them on our beds but today I have them safely tucked away. I want to preserve them for my children. The Christmas quilt is special ... a reminder of Christmases past. 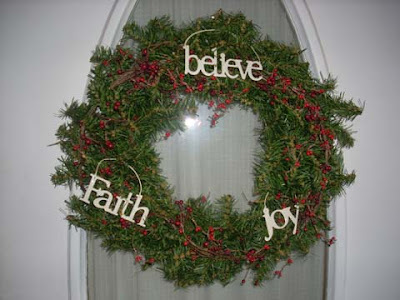 Christmas: Faith ... believe ... joy. 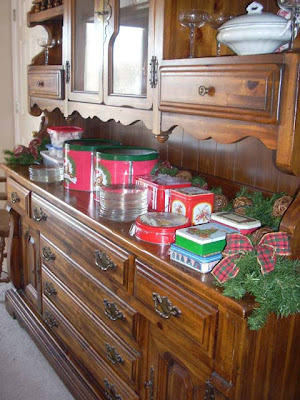 All that baking paid off with tins full of goodies ready for company. 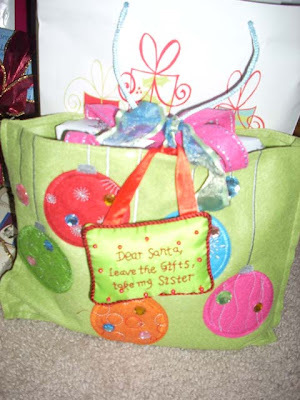 "Dear Santa: Leave the gifts ... take my sister"
The gift from my Texas sister arrived last week and is under the tree. Don't you just love a sister with a sense of humor? 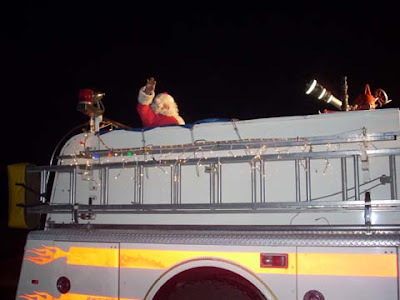 Swoope Fire Department's Santa greeted neighbors over the weekend as he did in 2007. 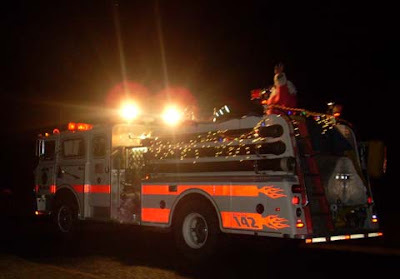 "Merry Christmas to all ... have a fire-safe holiday!" Sugar cookies, gingerbread people, gingerbread snowmen, Forgotten Cookies, pressed cookies, fudge, chocolate-covered toffee ... the cooking possibilities are endless each year as we get together for our cookie baking weekend. A tradition that has gone on for years, SWAC Niece, SWAC Daughter, my sister, and I get together in December to turn out dozens of cookies and many pounds of fudge and toffee for serving to guests and to give as Christmas gifts. Sometimes we join up with Mom to make fruit cakes ... hers are the only ones I like. The Westend Assembly of God's 2008 Christmas program. 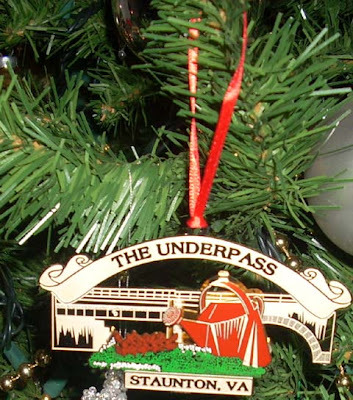 The Staunton Junior Woman's Club's 2008 Christmas ornament commemorates one of the city's most memorable landmarks: the railroad underpass and the huge, oversized watering can. SWAC Niece has been traveling to my house since she was a little girl. She would always go to sleep on the two-hour trip from Richmond but would wake up as they drove through Staunton. When she saw the watering can at the underpass, she knew she was almost to Aunt Lynn's house. The Staunton Underpass is the gateway into Staunton's Historic Wharf District. The Chesapeake and Ohio Railroad established the bridge to bring trains into the historic railroad station in 1854. The Station and Railroad played an important economical and historical role in the development of Staunton. The track is still in use today by Amtrack. Amtrack stops at Staunton's railroad station three times per week in each direction on its route between Washington, DC, and Chicago. The Water Can, placed at the Underpass, has been greeting visitors to Staunton's historic district since the mid-1990s. It has been given the official title of the World's Largest Watering Can. The Staunton Watering Can sculpture was created by local artist Willie Ferguson. The Water Can is approximately 18' tall and 20' wide and is surrounded by beautifuld isplays of seasonal flowers; in 2004, the City of Staunton received a Keep Virginia Beautiful Award for the display. The Watering Can and Giant Flower Pots were created to honor local humanitarian Barbara Hunter Grant. Ferguson has many other large sculptures around the Staunton area including an open book at the library, crutches at the hospital, and a giant boot at his shop. 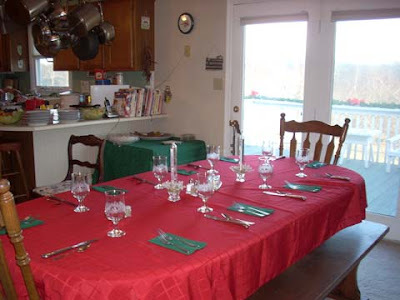 Christmas 2008 ... The Underpass and the Watering Can. Cat has graciously offered to host the 2008 version of the Carnival of Christmas ... but if you want to participate, you had better hurry. The deadline is tomorrow, December 23. 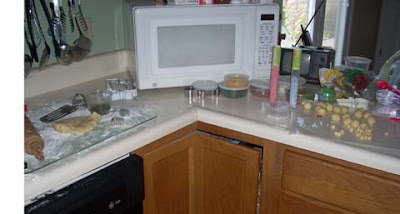 Check out her post to see what is acceptable, what is not, and how to go about entering. Thanks, Cat ... and Merry Christmas! Christmas ornament hand-painted by 10-year-old Stacy. As I was growing up, a tradition in our family was for my parents to give us ornaments from places they had traveled each year, and SWAC Husband and I continued the tradition with our children ... so we have a number of "special" ornaments that are placed on the tree year after year. 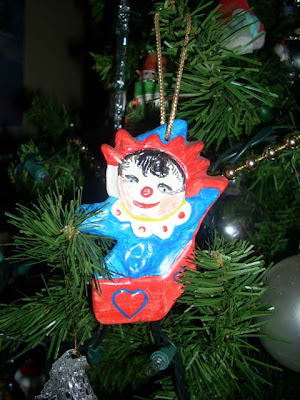 As I carefully unwrapped the tissue paper from around one particular ornament, memories flooded back as I saw the hand-painted ceramic decoration for the tree. Stacy touched my heart more than any other child I worked with because of his devilish sincerity. I loved that child. He was from southwest Virginia, one of many children from a large, poor Appalachian family. As best I can remember, his siblings were playing cowboys and Indians and tied him to a tree, piled leaves at the base of the tree, and set the leaves on fire. Stacy was horribly burned, so much so that both legs and one arm had to be amputated. He came to Children's Hospital for rehabilitation. The patients at the hospital lived in the dorms and received daily treatment as well as schooling. Stacy was with us for a long time as they worked with him to heal his stumps so he could receive prosthetic devices to help him lead a normal life. For someone who had been through such a horrible experience, he had a devilish sense of humor. He was funny, playful, and almost always in a good mood. Perhaps it was the love he received from all of us as he went through physical therapy, recreational therapy (which was where he painted the Christmas ornament), and the one-on-one education he received. I still remember the day he presented the decoration to me. 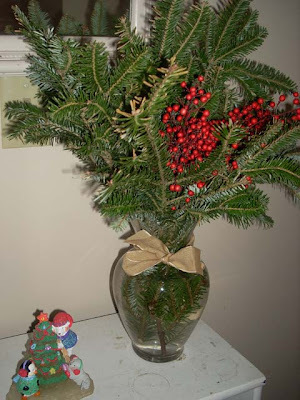 I kneeled beside his wheelchair to be at his eye level as he flamboyantly presented it to me ... then I took it home to my Christmas tree and, after the holidays, packed it away. Every year for the past 32 years it has been placed on my tree. Stacy would now be a young man in his 40s. I don't know what happened to him ... I lost track after leaving Children's Hospital. I have often wondered where he was, how his life turned out, and if he was able to handle the emotional scar of such a life-changing incident so young in his life. 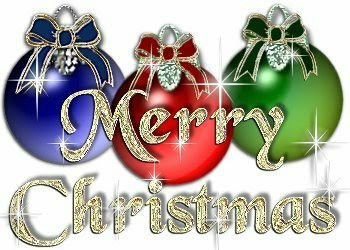 Christmas ... the Christ child ... follow the star ... family ... friends ... presents ... fellowship ... winter sweaters ... twinkly white lights ... Christmas trees ... church ... warmth of those we love ... neighbors ... pets ... winter. Spiders take down Grizzlies ... congrats, University of Richmond! What a win Friday night for the University of Richmond's Spiders! They were the champions of the NCAA 2008 Division I Football Championship ... their first national title ... beating Montana (who has shot down Harrisonburg's James Madison University the week before) for a 24-7 finish. Part of the incredible journey is the story of Coach Mike London, 1983 UR graduate and former Richmond cop, who was appointed head coach at UR in January 2008. Congratulations to UR and students/alumni. Should Virginia's governors have consecutive terms in office? In a front page story today titled Power to Govern, Bob Stuart at the Waynesboro News Virginian asks the question, "Should Virginia's governors have consecutive terms in office?" He talked with former Gov. Jim Gilmore, a spokesman for former Gov. Mark Warner, and James Madison University political scientist Bob Roberts as well as Del. Chris Saxman and Del. Steve Landes, all with varying viewpoints. Good article. It is the shortest day of the year ... the first day of winter. Bring on the snow! No ... snow is not in the forecast for this week ... but we are waiting. My snowboarding daughter has her gear ready to go ... my snowboarding son is ready to hit the slopes ... I'm anxious to invite friends over to sled in the back yard. But, first, we need snow. "America needs God more than God needs America. If we ever forget that we are One Nation Under God, then we will be a nation gone under." Imagine a little village that existed long before colored lights, reindeer, or Santa Claus. Roman Soldiers walk the streets, Wise Men appear with their camels, shop keepers are going about their everyday lives yet this village is on the brink of something immense, the birth of one who would forever change the course of human history. Experience this village as it really was. Come to Bethlehem and see for yourself the magic and wonder of the first Christmas. Step back in time as you enter the gates of Bethlehem of Judea. The Roman emperor has issued an order that a census be taken throughout the Empire and every citizen must register. On a cold winter’s night you are traveling streets illuminated by torchlight, wandering deeper into the heart of a village where cautious Roman soldiers patrol the crowd, Wise men, shepherds, livestock are among the many passersby, shops and shopkeepers inhabit a bustling marketplace, and welcoming cheer abounds. Now, far away from the tinseled trees and crowded malls that most commonly usher in the Christmas holiday season, this is an event no one should miss. Open daily Friday, December 19 thru Tuesday, December 23, from 6-9 pm. Admission is free to the public. Donations are accepted for the Village and Restaurant to help with costs. Gift shop available. Hispanic Tour: This year we will have a guided tour in Spanish starting at 7:00 pm on Tuesday, December 23. Communion Service: Join us for Communion in the Village on Tuesday, December 23, at 8:30 pm. Special Afternoon Hours: This year we will open at 4:00 pm on Sunday, December 21 (one day only), to allow visitors to enjoy the Village during day light hours. Click here for a map to Hebron Baptist Church. For more information call (540)456-6863. Background: The Bethlehem Village Project is a community effort of local churches and friends from the Afton, Waynesboro and Charlottesville, Virginia, area. The village is located on the grounds of Hebron Baptist Church in Afton, Virginia, and is maintained by the generous efforts of this fellowship. 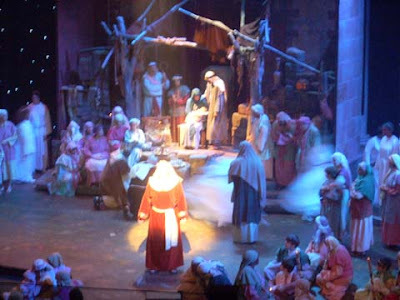 History: Nestled in the foothills of the Blue Ridge Mountains a highly dedicated group of volunteers is transporting delighted spectators back to the 1st century with one of the longest continuous running "Village of Bethlehem" productions in the country. The Bethlehem Project was conceived in 1999 by Rev. 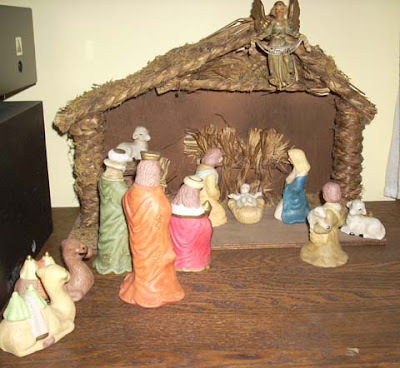 Jim Ailor (Hebron Baptist Church pastor at the time), who, having studied a miniature model of Bethlehem and the nativity, decided to recreate historic Bethlehem for people to experience firsthand. He rallied members of Hebron and surrounding churches together to create a temporary village during those first few years. It began with just a few shops and characters in the parking lot of the church. Each year the village was erected and dismantled for the event. In 2004 Hebron Baptist donated land to allow the village to be constructed as a permanent collection of buildings and stables. It continues to grow each year in its scope and dramatic portrayals while still maintaining the authentic feel of a small village around the 1st century. It is well worth following the star to the Bethleham Village at Hebron Baptist Church at Afton. Christmas is less than a week away. Are you feeling in the Christmasy spirit? Click on the links to listen to some classic Christmas songs including "Christmas Country Christmas" by hometown Staunton natives, the Statler Brothers ... and my favorite, "White Christmas." "Twas the Month Before Christmas"
JMU ... thanks for the great season, Dukes!